Should you have any doubts or queries about any of our services, or should you require a special service, then please contact us on: +34 948 340 406. We'll be delighted to help you and to answer all your questions! Take a look at our fantastic facilities! In summer, the Camping el Molino swimming pool is a delight for kids and adults alike. Enjoy zooming down the flume into the water, or simply relax in the jacuzzi. There's also a sun terrace, to soak up the sun and watch the occasional passing cloud. Our indoor pool with Spa is ideal for relaxing after a long day exploring Navarra. It's open all season and, at nightfall, you'll be able to enjoy contemplating the moon and stars. A real luxury experience that you'll want to repeat! Our campers just love the fact that we've got our own jetty on the Arga River. A journey down this river is a real experience, allowing you to take in all the natural beauty of the riverbank and to discover the bridges, footbridges, mills, etc. along the river. You can take out a canoe or pedal boat to travel along this river park of exceptional beauty. The Camping el Molino restaurant offers guests the opportunity to sample the delicious regional cuisine, lovingly prepared and giving particular importance to seasonal produce. There is also a snack-bar and Cafeteria-Bar. If you need to do some shopping or get a product you've forgotten to bring with you, there's no problem! Simply visit our store, which is always open during the high season. Freshly made bread is on sale in our store each day. If you'd like to do your own cooking, yet haven't got the equipment, then here are also a number of kitchen facilities for hire, with microwave ovens and fridges. Or, if you prefer char-grilled food, then there are barbecues with picnic tables for a pleasant culinary and leisure experience. Camping generally involves doing a bit of sport. Therefore, for all those of you who exercise on a daily basis, there are a whole range of options available: 2 squash courts; football pitch; 5-a-side football; basketball; mini golf and tennis court. 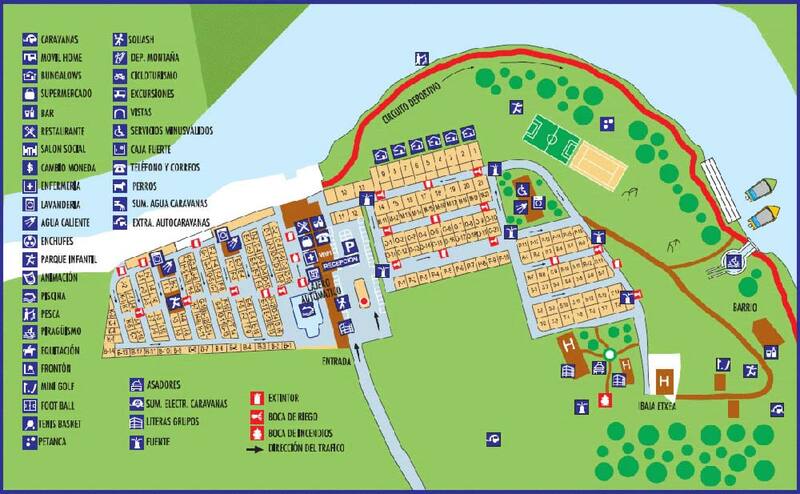 What's more, there's a green area for recreational purposes covering 36,000 m2, making our campsite a benchmark in the north of Spain. And, of course, for the little ones, there's also an adventure playground, where they can become true explorers, climbing the nets and zooming down the slides. At the Camping El Molino, we know all too well how important pets are in our lives. So they're welcome here! They're allowed to stay on the pitches or in the Gitotel Bungalows. Over the years, we've noted how they run around, jump and splash about, romp in the mud....in the campsite and surrounding area... and so we decided that they ought to have their very own bathtubs. So, once they're dirty, then straight into the tub they go! The staff at our reception desk will be delighted to help you any time during your stay. What's more, as they know the area well, they'll be pleased to give you any information you may need on the tourist attractions in Navarra. Tourist brochures are available in a number of languages, featuring trails, monuments, delightful villages, etc. And, if you need to take out cash, then an ATM is available. During the high season at the campsite, many different kids activities are organised by our kids entertainers. We've got a whole range of fun-packed activities lined up for the little ones, so that they're sure to have the time of their lives!